Unsavory food is unpleasant. Just as Job describes, it is “loathsome to me.” You always hear on those cooking competition, tv shows, the judges negatively critiquing the competitively prepared dishes, especially when the dishes are under seasoned. I always roll my eyes at the carelessness. How do the competitive chefs miss adding the salt? Even the most basic meals become a symphony of flavor, when just salt is added. It’s so basic, yet so effective. Like when your computer at work starts acting up and the I.T. guy asks whether or not you shut down and restarted the computer. You feel like an idiot. Then you reboot it and it’s back to working properly. It’s the same for the competitive chefs. One simple step, adding salt, can make all the difference in the world. Salt is used in many different contexts in scripture. I am not going to attempt to tackle it’s different applications to any great degree, but I am going to focus on the main point of its symbolic usage in the Bible: the Gospel. I find it interesting that God uses salt as an illustration to remind the Levite priests about His covenant with them, through salt. Just as their grain offerings will become better with salt, so will their covenant with God become better when the flavor of the covenant is brought out by their obedience to Him. 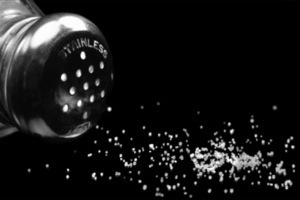 I urge you, my brothers and sisters, to “Please, Pass the Salt,” and add flavor to an unsavory world. The Great Commission is our main purpose until our Lord returns.